On 10 March 2017, following the occasion of the Africa Day for School Feeding, The Gambia Government through the Ministry of Basic and Secondary Education (MOBSE) and the World Food Programme (WFP) highlighted the important role of partnership in achieving a sustainable school meals programme. 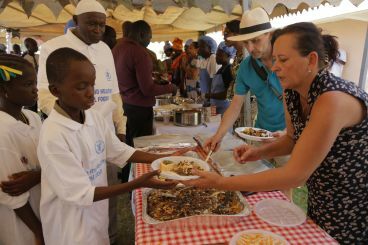 The day was marked by food fair and a march pass by children from schools that benefit from the school meals programme. Participants of the food fair were drawn from the public and private sectors including school nutrition associations, the Ministry of Agriculture, UN agencies, restaurants, hotels and the spouses of Ambassadors. More than 100, 000 students in 368 schools in all six regions receive daily meals each year thanks to the Government of the Gambia and valuable support of donors such as the European Union, the Governments of Japan and the Republic of Korea. In The Gambia, the Government, supported WFP, UN agencies and development partners’ work to integrate school meals as a national safety net into the national development plan for sustainable growth and empowerment. The Ministry of Basic and Secondary Education, in a statement on behalf of the Gambia Government, said that the Government with other stakeholders will support the expansion of school feeding and strengthen the establishment of school canteens to improve the nutritional standards of school children. Partnership remains integral to harnessing joint effort towards a sustainable nationally led programme which addresses the health and nutrition needs of children while boosting smallholder production through commodity purchases”. Angela Cespedes, WFP Representative and Country Director. WFP in partnership with the Government is piloting Cash Based Transfers in schools where the provision of daily meals is led by Food Management Committees and key community members or caterers. The initiative offers more flexibility to include local foods, improve diet diversity in schools and empower communities. Learn more about this event in The Gambia (East Africa) and WFP.